Ekornes Authorized Price Reduction Sale is Going on Now at Unwind! The Unwind Company is proud to offer White Glove Delivery and Installation, Sales Tax Benefits, Exemplary Customer Service, and more to provide the best value on all of our sofas, sectionals, and home theater seats. We use the quickest shipping methods to not only deliver your products but to also get your Specialized and Custom Orders back from the Manufacturer. Several Models can be custom ordered in any layout and ready in approximately 30 days. If you want to learn more about expedited shipping options for any items, give us a call at 888-486-9463 and we will be able to provide a variety of options, guaranteed to suit your needs. If you know what you are looking for and are ready to order, our team of dedicated Ekornes’ Brand Furniture Specialists, can place your order over the phone in a matter of minutes. We help you save money and simplify the shopping process. Your time is important. That’s one of the reasons we offer multiple Fast Shipping options. Visit your preferred Stressless Sectional or Ekornes Furniture Component product page. When ready, click the "Proceed to Checkout" button, or the “Cart” button at the top right of the page. Follow the on-screen instructions to complete your checkout and you’ll be relaxing comfortably in your new Stressless Sectional Sofa very quickly. Create your own custom-design or choose a pre-designed Sectional Layout. Add as many or as few seats as you need. Have an odd-shaped room? Not a problem. Our incredibly knowledgeable and experienced staff can create digital designs of your future Ekornes Furniture. Simply call 888-486-9463 and ask to speak to a Sectional Expert. Maybe you are a DIY kind of person, if so follow this link: Stressless Design Online. If you aren’t quite sure which model or layout you would prefer, drop us a line or send us an email with a request for a digital design. Our dedicated team can create you a few Stressless Sectional Layouts, guaranteed to suit most tastes. Simply send us an email at info@unwind.com or send us some photos of your current room and let our designers begin to configure a Stressless Sectional for you. Stressless Sectionals allow you to turn your furniture into more than just seating. It creates a space of comfort and harmony that your family can retreat to and truly unwind. 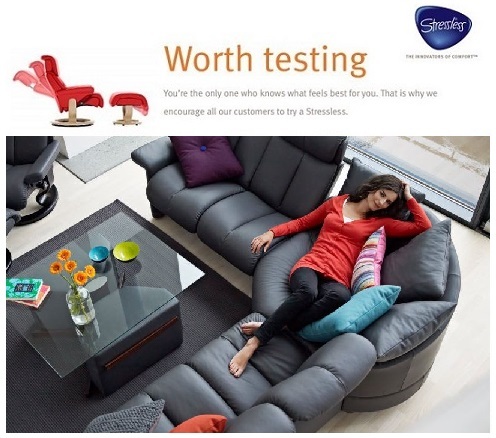 Learn more about Ekornes and what makes them stand out among the rest: [About Ekornes] Stressless Recliners and Sectionals/Sofas are delivered fully assembled and include the Full Manufacturer's Warranty. We guarantee the lowest authorized delivered price anywhere in the U.S. (and North America). Choose the beautiful Cori Leather for your upholstery or even the incredibly durable Ultrasuede® for select models. These select models include the Legend Series, the E300, Liberty, and more. View our Blog to learn about what's new in detail or drop our Ekornes Brand Specialists a line at 888-486-9463 Monday-Saturday during normal business hours. The Unwind Company (and Unwind.com) Stocks 100's of Ekornes Sectional pieces, Stressless Recliners, Ottomans, Tables and Accessories that ship with White Glove Delivery or Inside Residential Delivery options (you've got plenty of delivery choices). Let us deliver and setup your new Stressless Sectional in your home and remove the packaging when we're done (continental U.S. only).